Wow, it's been ages since I've posted anything. Spring sort of happened, (although most people in the Northeast are still in doubt), and life got a little hectic. Still, I've managed to make some progress on my Martha's Vineyard wedding outfit. I guess one could say I've been productive but silent. 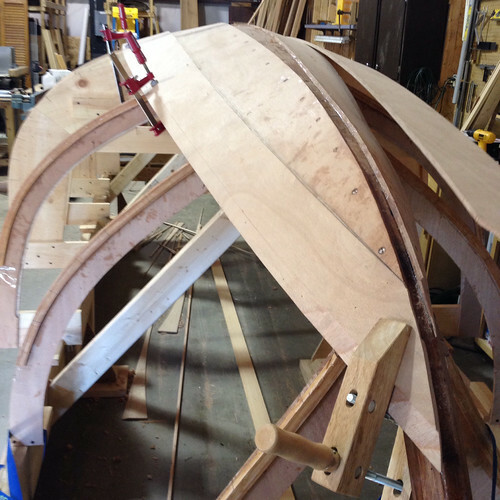 Still, I have a ton of work to do if I ever want to be ready by Labor Day weekend. 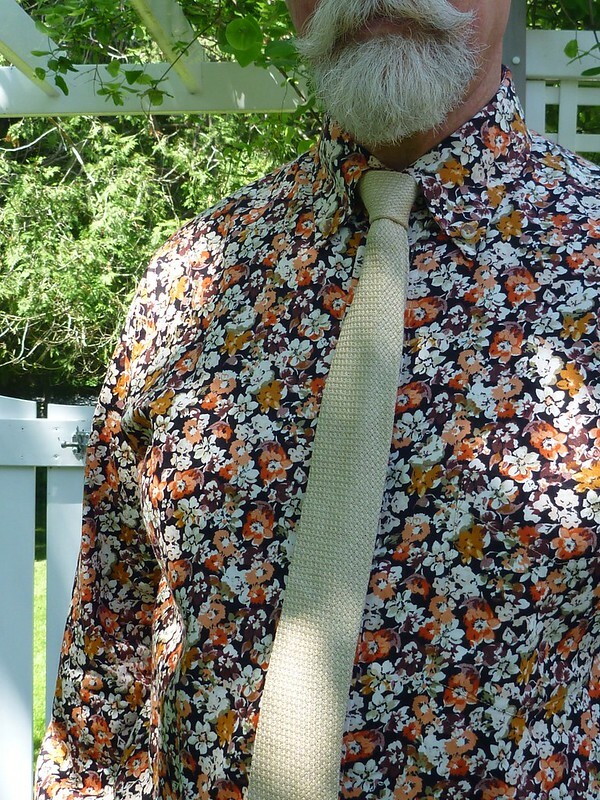 After finishing my Jeds, I moved immediately to the "wedding shirt" because I knew I could bang it out using my TNT shirt pattern. So here it is. Squeee. 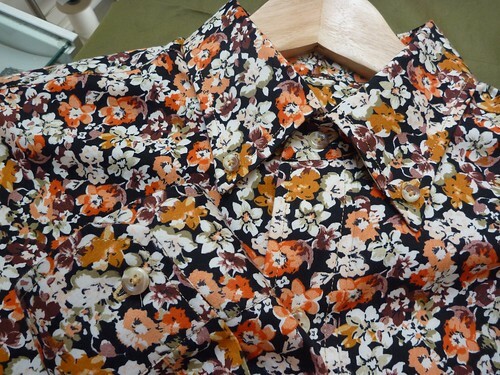 Another floral shirt! This cotton fabric from Elliott Berman was a dream to work with. 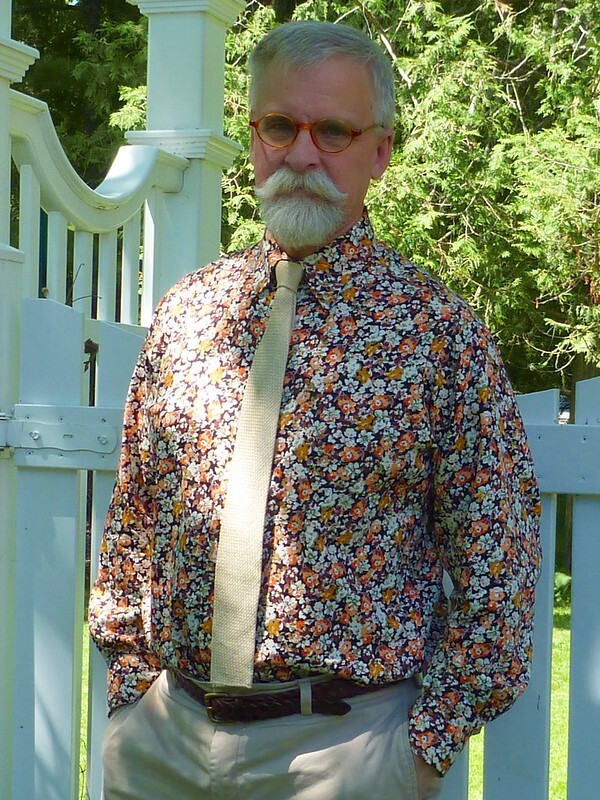 A point collar with collar stays may have been more appropriate for a somewhat formal occasion, but I opted for a buttondown because I want to wear this shirt A LOT after the wedding. 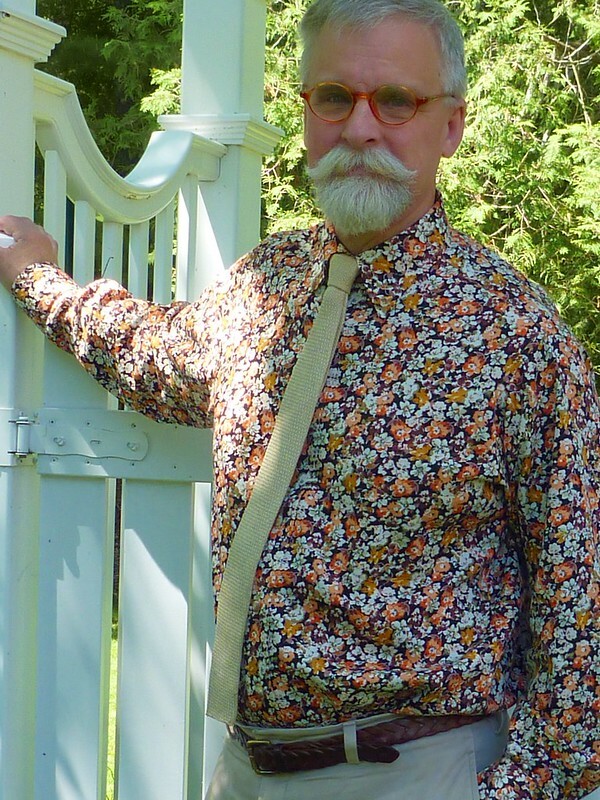 I can get much more use out of a buttondown, and it would be a shame to have a shirt this gorgeous just hanging in the closet. I wish you could feel this fabric. Heavenly. I'm wearing it with a vintage raw silk Rooster tie that I've owned for ages. I'm scouring Etsy and EBay for other alternatives. I'm really liking the skinny look. I wasted a huge amount of time trying to match this fabric, AND did a poor job of it! The front placket matched perfectly at the neck, but gradually ran off course down the front of the shirt. I'm sure you see it in this photo where my tie is askew. It makes me feel like I need to make an appointment with the ophthalmologist. Almost painful! Live and learn. I would never bother to match a busy fabric like this again. My daughter from CA assures me that no one will ever notice. On a brighter note, I did a great job matching the left front chest pocket. Trust me, there's a pocket there. 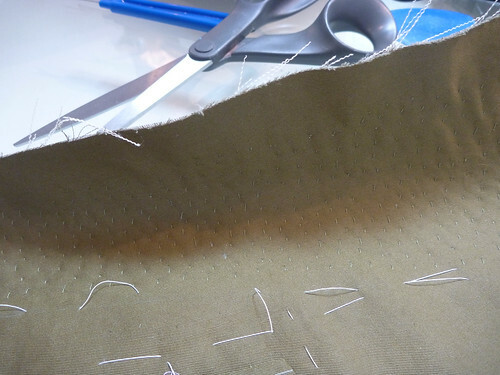 I experimented with several different thread colors for the topstitching and buttonholes, and settled on a muted gold color. 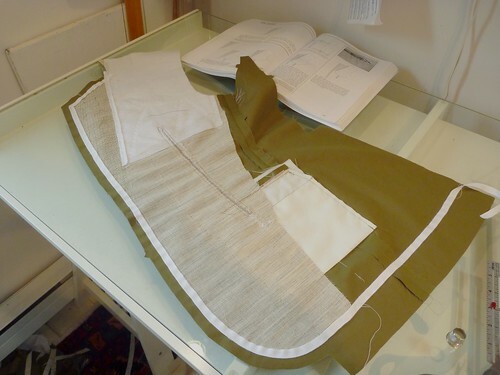 It almost disappears, as do the buttons, which are the color Latte from Fashion Sewing Supply. I strongly suggest that anyone interested in making shirts pick up the entire range of shirt buttons that Pam offers. They're a great value, and you'll always have just the right button. 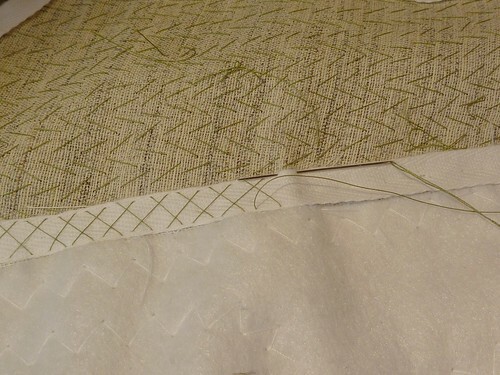 In case you forgot, my suit fabric is a olive green cotton / silk blend from Elliott Berman. It had a somewhat stiff "crunchy" hand so I decided to prewashed it in cold water and run it through the dryer. Ooops! I ended up with a wrinkled mess that I just couldn't iron. In a slight panic I dropped all 6 yards off at the dry cleaners and asked them to steam press it. 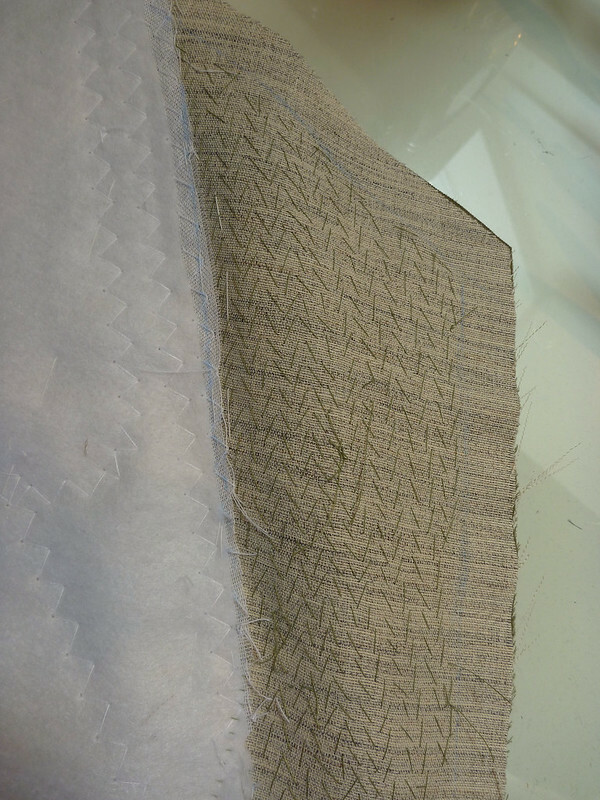 Their result was only slightly better than mine, so I'm going to have to embrace the rumpled nature of this fabric. So here's where I stand. 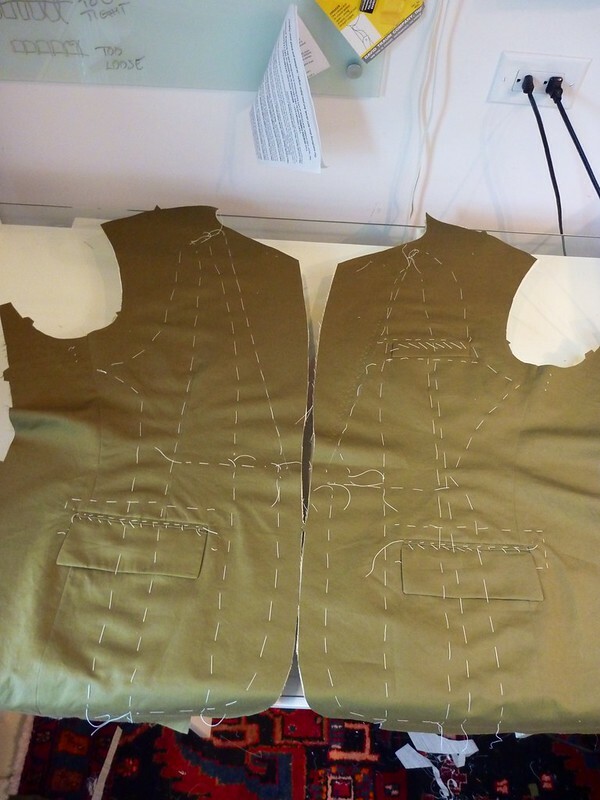 The pockets are done and the jacket fronts are basted to the canvas. 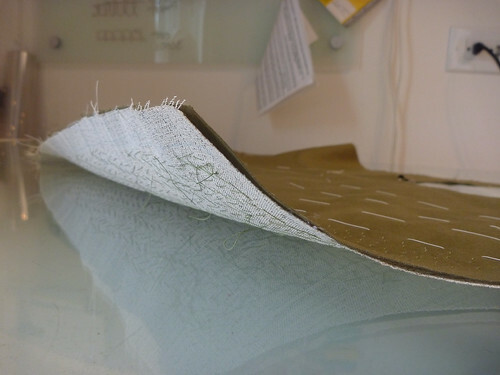 I'm using a lightweight premade canvas from B. Black and Sons. It's very inexpensive and saves a great deal of time, which is of the essence right now. 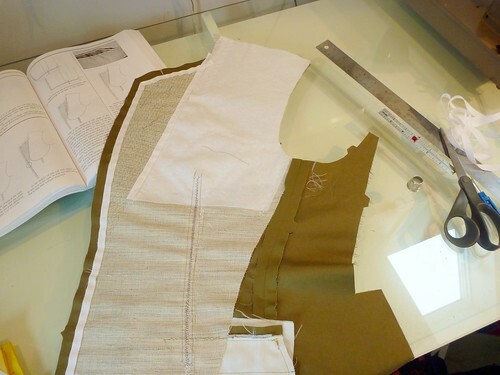 The pockets are made according to the directions in Roberto Cabrera's book on men's tailoring. I'm really pleased with how they came out, especially the flap welt pocket which I've never attempted before. What I love about Carbrera's instructions is that you can toss out all the fussy little pattern pieces. 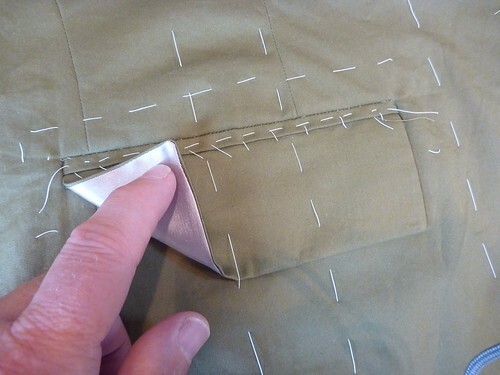 The pockets are composed of simple rectangles that get marked, folded and stitched. "Sewing origami" is my name for it. Somehow, it all comes together, and I love when that happens. 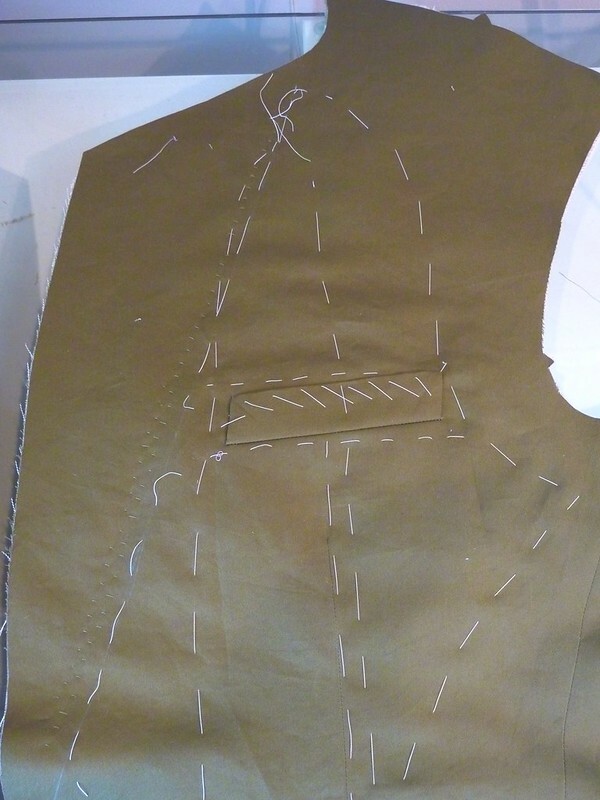 I plan to add a pick stitch detail to the pocket flaps and lapels of this jacket. 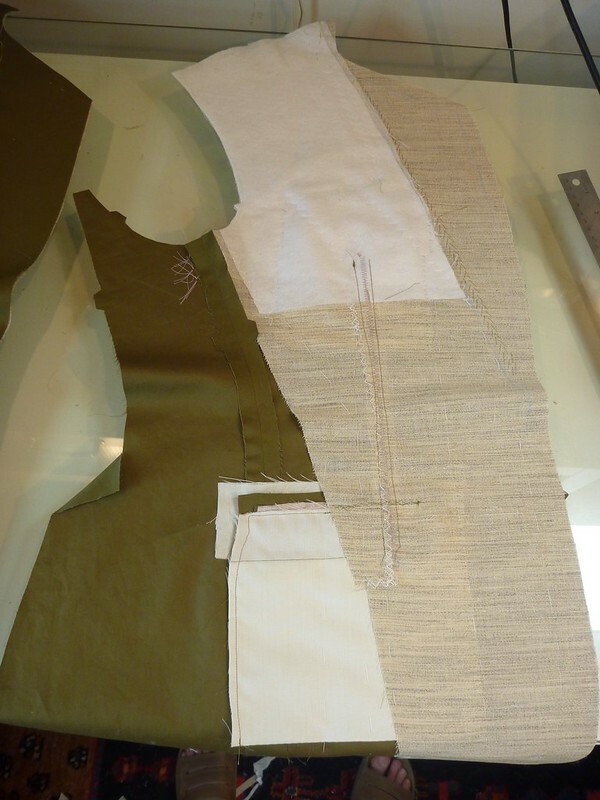 The next step is to pad stitch the lapels and add the twill taping to the front edges. 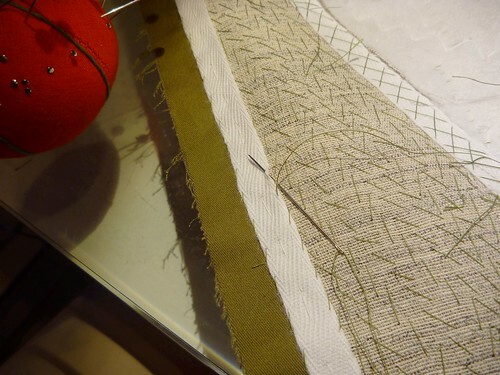 Lots of handstitching in this man's future! 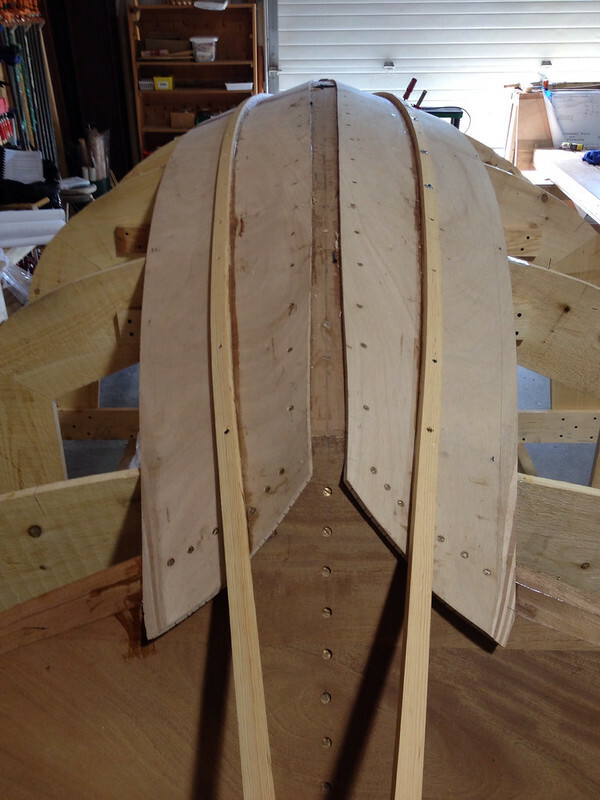 Oh, and I've finally started planking the boat!